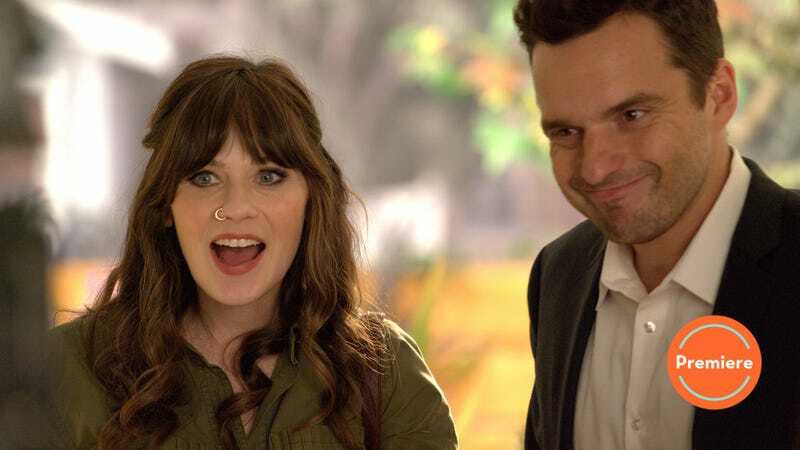 As New Girl hurtled toward the end of its sixth-season—and, at the time, the possible series conclusion—its last seconds showed Jessica Day and Nick Miller yelling, “Stay right there!” as they frantically raced toward each other. They didn’t stay put, though, and that’s how they ended up in each others’ arms, kissing passionately as the elevator doors open, right there in the building where they first met. They didn’t stay put; they didn’t “stay right there.” They ran toward each other. Staying put isn’t what people do, and it’s not what stories do. New Girl has kept moving, and so have its characters. In the three-year time jump since season six, Cece and Schmidt have been raising their daughter, Ruth Bader Parekh Schmidt. Cece’s business has grown, and Schmidt has become a stay-at-home dad. Winston and Aly have married and Aly is pregnant with their child. Nick is a successful author, just returned from his book tour for the sequel that “Magatween magazine is calling ‘this year’s longest Pepperwood,’ and Jess has left education and joined him in his world travels. Winston has moved on from bird shirts to fish shirts. Along with these big changes, “About Three Years Later” doesn’t shy from some shameless fake-outs, as silly and small as the low end of the Winston Bishop Prank Sinatra scale. The previously-on refresher of Nick and Jess’ season-ending elevator kiss cuts to the season’s cold open: another elevator door sliding open to reveal Jess and a strange man, arms linked, announcing their love for each other. But these feints are as harmless and as sweet as Winston Bishop himself, and they don’t tease the viewers for long. A beat later, it’s clear that this stranger is the husband of Nick’s publisher, and the four of them have bonded over their six-month European tour. The three-year gap means missing some milestones. Winston and Aly’s wedding joins New Girl’s list of unseen but often referenced celebrations (we’ll never know what happened to the candy on Halloween 2004 or how the whole gang took peyote on Thanksgiving 0f 2015, and we were never meant to), going down as the group’s new benchmark for drunken mayhem. Schmidt quitting his marketing career, Cece’s pregnancy, the birth and infancy of Ruth Bader Parekh Schmidt (played adorably, maybe even adorkably, by Danielle and Rhiannon Rockoff)—all these developments and moments of growth are swallowed up in the time jump. Speaking of “moments of growth”: Schmidt’s mustache. As Schmidt interrogates him about why, exactly, he hates the mustache, Nick insists, “There’s no deeper level!” But there’s always a deeper level, in-story and out. For Nick, Schmidt’s mustache means that even after he comes home, there’s a part of his long-missed friend that’s still under wraps. It’s a symbol of the time they’ve spent apart. Happy time! Productive time! Joyful time! But time apart nonetheless. The fake-outs continue. “What’s on Mama’s finger” turns out not to be an engagement ring, but Jess’ cast from a Vespa accident. A sudden cut to Cece and Winston, gleaming and gasping with exertion as they fall back on a bed, is just the two of them hastily turning a mattress while Aly is distracted. Nick’s carefully orchestrated proposal as he and Jess return to the loft—where this all started—is interrupted again and again: by Russell bursting in to repeat his job offer, by Cece and Schmidt arriving with child and cake in arms because “someone stole all our knives” (“And the nightstand!”), by Winston showing up to swoon over Aly’s breakthrough. But Nick doesn’t let the interruptions sidetrack him, and soon he’s face-to-face with Jess, heirloom ring in the package in her hands, their closest friends looking on. And that’s when Jess herself derails Nick’s plan with her reassurances that nothing needs to change. This whole segment, with its repeated interruptions and postponements, returns to the farce that drives “Three Cheers For Beezus”—no accident, since “About Three Years Later” is also directed by executive producer Erin O’Malley. 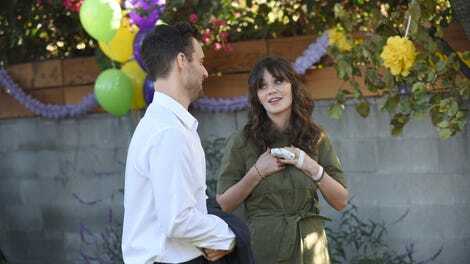 New Girl staff writer Berkley Johnson, who’s credited with episodes like “Spiderhunt” and “Goosebumps Walkaway,” captures the energy of the sixth-season finale in this closing scene. In the show’s final season, as in the then-presumptive series finale, there’s little tension in the will-they/won’t-they; all the show’s energy has to come from the how. The closing credit sequence of Nick shaving Schmidt’s mustache brings us back to the central love story of New Girl, long before Nick and Jess: the love story of Nick and Schmidt, two polar-opposite weirdos who love each other fiercely, often furiously, and without reserve. Welcome back to New Girl coverage for its seventh and final season! Like Schmidt, if it’s anything less than perfect, I am going to call a professional samurai to chop me in half. (That seems proportional.) And as always, thank you for reading.